Have a bumper crop of tomatoes begging for recipes? Vine-ripened juicy tomato slices or fresh tomato sauce are incomparable to winter’s hot-house tomatoes. But I tend to be a miser when I have terrific tomatoes. So when I developed this recipe, rather than cooking bushels of tomatoes down to a thickened soup, I cheated a little by adding pantry staple canned tomato sauce. (So I save more of my fresh tomatoes for slicing!) 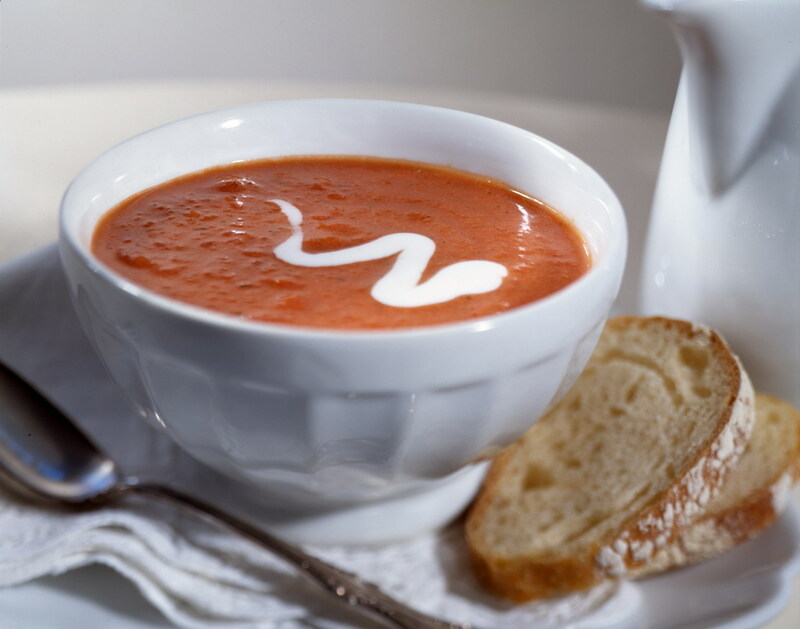 The soup has fresh tomato flavor that holds up to milk or cream for a smooth and silky richness. Sweet-tangy seasoned rice vinegar peaks the tomato flavor and adds a little kick. Perfect hot or chilled on a summer night. In a large saucepan, combine tomatoes, onion, rice vinegar, thyme, oregano and pepper; bring to a boil. Reduce heat; cover and simmer 10 minutes. Cool slightly. Puree soup in a food processor or with a hand-held immersion blender until smooth. Return to saucepan; stir in cream (or milk) and tomato sauce. Bring to a simmer over medium heat. Simmer, uncovered, stirring occasionally, 10 minutes or until thickened and slightly reduced. Serve hot or chilled with a drizzle of yogurt or sour cream. Roma tomatoes have less juice and seeds than slicing tomatoes and will produce a thicker soup, but any variety works well. I use regular canned tomato sauce, no additional seasonings. Try Rita’s Fresh Tomato Sauce for another in-season tomato recipe. An original recipe by Rosemary Mark. Photo by Lisa Keenan, styled by Vicki Roberts Russell.